In 1948 an Afrikaner government came into power. The system of segregation known as apartheid (separation) formalized and made more rigid the racial barriers in South Africa. The government's policy aimed at complete social, economic and political separation of the races, while ensuring white supremacy. 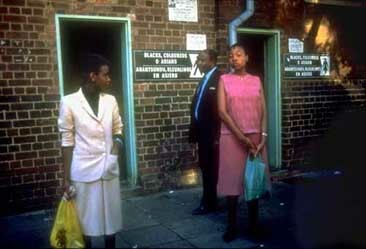 The Pass Laws required a pass of nonwhite South Africans when out of their segregated areas. Blacks were required to carry a pass when outside of the reserves. The pass laws became a focus of protests as resistance to apartheid mounted.